Yet the Pillar of Fire's pulpit and the Pillar of Fire's printing operation were used extensively to advocate for many of the most intolerant of Klan values. In 1922, Bishop Alma White preached a sermon promoting the Klan at the Pillar of Fire Church in Brooklyn, New York (which coincidentally was incinerated by the 1960 New York air disaster ) and published that sermon in The Good Citizen. The speech was titled "Ku Klux Klan and Woman's Causes" and one section was subtitled "White Supremacy." The Klansmen stand for the supremacy of the white race, which is perfectly legitimate and in accordance with the teachings of the Holy Writ, and anything that has been decreed by the Almighty should not work a hardship on the colored race ... It is within the rights of civilization for the white race to hold the supremacy; and no injustice to the colored man to stay in the environment where he was placed by the Creator. ... When the black man was liberated it was time for women to be enfranchised, without which the colored man with his newly-acquired rank became her political master. ... The white women bore the sting of humiliation for more than half a century in being placed in an inferior position to the black men in the use of the ballot and the rights of citizenship ... To whom shall we look to champion the cause and to protect the rights of women? Is there not evidence that the Knights of the Klu [ sic] Klux Klan are the prophets of a new and better age? The Pillar of Fire Church strongly argued against social and political equality for Blacks and advocated for racial segration and repeal of the fifteenth amendment. The Pillar allowed the Klan to hold meetings or cross burnings on at least several of the church's numerous properties including numerous documented Klan gatherings in Zarephath, New Jersey; Brooklyn, New York; Bound Brook, New Jersey; Longmont, Colorado; and Westminster, Colorado. White participated directly in many of these meetings. 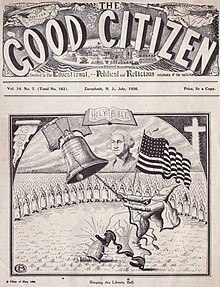 During this time, the Pillar of Fire Church published The Good Citizen, a monthly 16 page political magazine and three books, The Ku Klux Klan in Prophecy, Klansmen: Guardians of Liberty, and Heroes of the Fiery Cross, all of which heavily promoted the Klan and its agenda from 1921 until 1933. Ideologically, in these publications, the Pillar of Fire Church promoted anti-Catholicism, antisemitism, nativism, and white supremacy, all primarily under the guise of patriotism. ^ " Pillar of Fire". Tax Exempt Organization Search". Internal Revenue Service. Retrieved July 9, 2018. ^ Neal, Lynn (June 2009). "Christianizing the Klan: Alma White, Branford Clarke, and the Art of Religious Intolerance". Church History: Studies in Christianity and Culture. 78 (02): 350. doi: 10.1017/S0009640709000523. White's words and Clarke's imagery combined in various ways to create a persuasive and powerful message of religious intolerance.